Hey everyone, this is Sarah calling from Team Mad Mix here on Kilimanjaro. And I am calling from a lively Barranco Camp right now. It’s about 8:30 in the evening. A bunch of us are tucked into tents; other folks from our crew are out enjoying the incredible stars and planets and view of the Milky Way. And we are all enjoying the fact that we had a great day today. We had a really wonderful hike. We got up at our usual time about 6:30, had breakfast around 7:30. We had french toast which was awesome! And then headed out on a nice, long hike and today was our longest day of the trip so far. 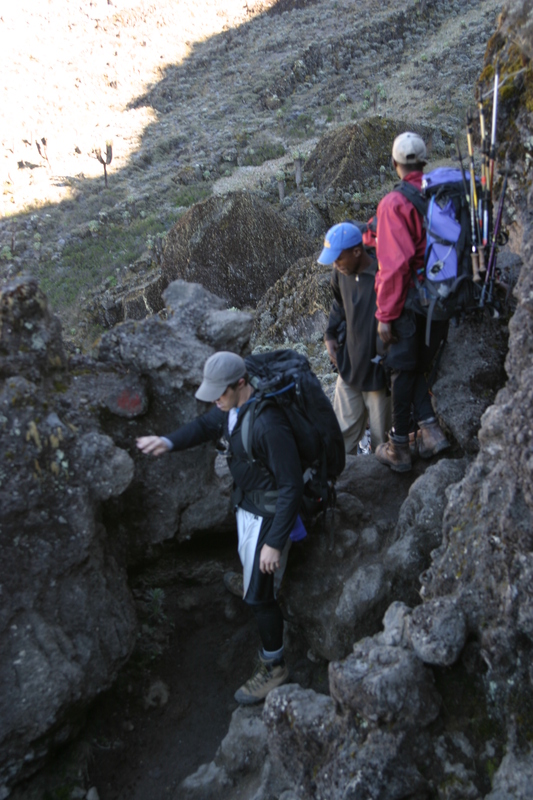 We hiked up to a point where we merged with the Machame Route, had a great lunch around noon, and then we hiked up to the base of the Lava Tower. Folks were feeling really good then. We had a few folks decide to just continue on down to camp, which was another couple hours. And then we had a crew of eleven or twelve of us go up to the top of the Lava Tower. Folks took some great pictures, had a great time scrambling up there, and came down. And we were all in camp around 5:30, had some tea and popcorn, and enjoyed the views. We had clouds rolling in and out. We really enjoyed the plant life around here, which is pretty different than what we see. And had a great dinner and we’re all looking forward to getting some sleep. Everyone is healthy and happy and doing well. So we’ll call you tomorrow, bye. Mont Blanc Team 4 summits Aig d’Tour and Petite Fourche with amazing weather! The team then descended Mont Blanc when storms settled in, concluding a fantastic vacation in the Alps!